One of our retired trolleys on a flatbed truck, arriving in Guaymallen, Argentina en route to Mendoza. Thanks to the kindness of Jorge Luis Guevara, we have pictures of our retired trolleys arriving in Argentina on Friday, Dec. 5! Jorge works for Empresa Provincial de Transportes de Mendoza (EPTM), the transit agency who bought our trolleys. He’s promised to send more photos of the buses during their journey in the Andes, too! Click here to email the Buzzer blog! 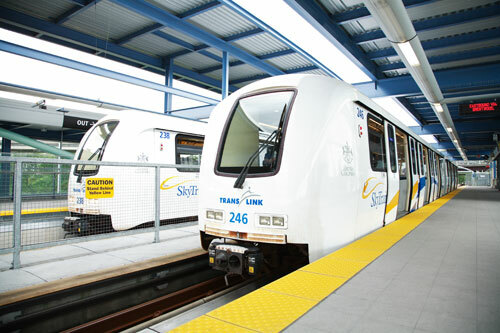 The 2009 budget will support many major initiatives that are reaching completion, such as the 48 new SkyTrain cars set to arrive next year. Our 2009 budget and capital plan was released to the media over the weekend, and it’s resulted in some prominent news stories today. I thought we’d take a little time to talk about the highlights and answer some questions you might have. Here’s the official press release that was sent out, if you’d like to read it as well. This is our biggest service improvement yet: 14.7 million extra trips were added to the Metro Vancouver region! 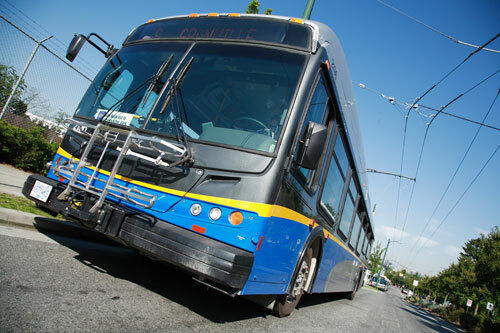 While you can find the full list of Dec. 29 bus service improvements in the print Buzzer, I also wanted to direct you to the full list of service changes on the TransLink website. I’ve also got some more information about the overall service changes, and some highlights and further info behind many individual service improvements. Shall we? 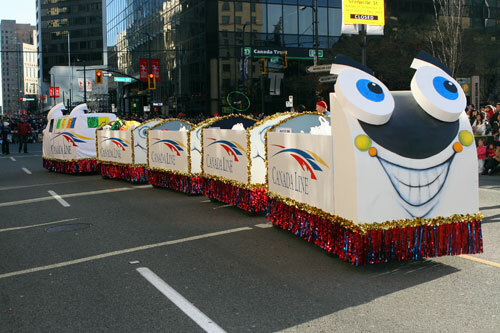 The Canada Line float from last year's Rogers Santa Claus Parade. This year, there will be a Canada Line float and a TransLink bus in the parade! No less than four Christmas parades are happening this weekend! Unsurprisingly, there will be some bus reroutes owing to all the Christmas cheer — please use the links below to see what reroutes will apply to your local event. Vancouver: Rogers Santa Claus Parade – many, many downtown Vancouver bus reroutes. SkyTrain will provide additional trains before and after the Rogers Santa Claus parade in Vancouver, to give you an easy, traffic-free way to get there and back. The parade starts at 1 p.m., and to get there, exit SkyTrain at either Burrard or Granville Station, and walk to Georgia. The Skytrain site has more info. The December Buzzer is out today! Get the latest Buzzer on all our buses, SeaBus, SkyTrain, and West Coast Express today! 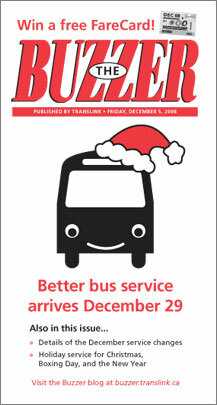 This issue has all the service changes planned for December 29, plus info on transit service over the holidays. Don’t forget to enter the FareCard contest too: you can win a free FareCard in every issue of the Buzzer. Read the issue, then answer the question right by Monday, Jan. 12 at 9 a.m. to win! Enjoy the latest Buzzer: comments are welcome below! The retired trolleys arrive in Chile! 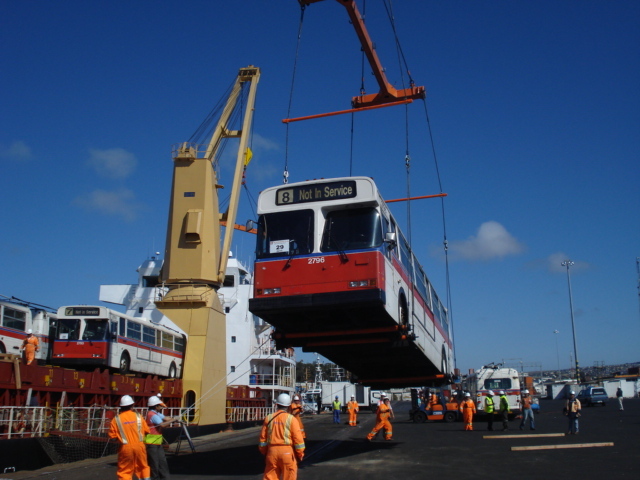 The retired New Flyer trolleys, being offloaded at the docks in San Antonio, Chile. After 20+ days at sea aboard the ship Wisdom, the retired trolleys arrived in Chile on Nov. 28! M/V Wisdom arrived safely in San Antonio Chile on Friday Nov 28th, and completed discharge of all 80 buses by Sunday Nov 30th. 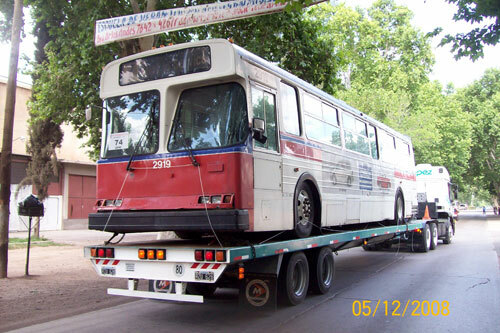 We understand the buses will now be transported in sets of 10-12 at a time on flat-bed trucks over the Andes highway into Mendoza. And CTL Westrans promises to send more photos when they get to Mendoza in Argentina! There’s one more offloading photo below, plus a few more of the trolleys being loaded onto the ship at the Fraser Surrey Docks. Click each picture for a for larger version. 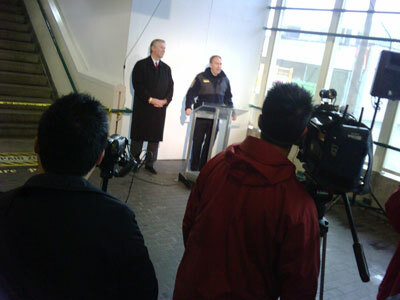 Doug Kelsey and Ward Clapham at the press conference, held at Broadway Station today. We held a press conference at Broadway Station today about new security measures SkyTrain is putting in place (or already has put in place!) on the system. Doug Kelsey, president and CEO of SkyTrain, and Ward Clapham, Chief Officer of our Transit Police, talked about these changes at the conference, and explained that they are happening due to the results of major research and public consultation initiatives on the topic of SkyTrain security. and a backgrounder on the differences between SkyTrain security personnel. I’ll also talk a little more about the major items from the announcement below. Late-night Wednesday Surrey SkyTrain travellers, look out! We’re doing the last bit of our track maintenance in the Surrey area, which affects service after 9:30pm on Wednesday, Dec. 3. Normal evening service on Expo Line from Waterfront to Scott Road (every 8 min), and Millennium Line from Waterfront to VCC-Clark (every 8 min); combined service every 4 min between Waterfront and Columbia. Reduced frequency between Scott Road and King George (every 16 min). All passengers must change trains at Scott Road. Passengers going to or from Gateway, Surrey Central, or King George, please allow an extra 10 minutes for your journey! The Buzzer blog podcast is back! This time, I’ve got the story behind the SkyTrain chime for you to hear. Ian Graham, operations planner for SkyTrain, talks all about how the chime was recorded, why we ended up with that particular sound, and who in the world actually played the chime. For your Friday Buzzer fix, here’s the first in a series of profiles I hope to do with transit enthusiasts from the Lower Mainland. Poke around the web in search of Vancouver transit info, and you’re bound to come across Trans-Vancouver, an insanely comprehensive bus photo site. Online since 2004, the site’s neatly organized galleries boast over 1,400 photos of every single bus in the Lower Mainland. That includes almost every ad wrap, heritage bus, and even one-offs like TransLink’s alternative energy test buses, or the time we tried out a double decker bus. My full interview with David, George, and Chris is below! 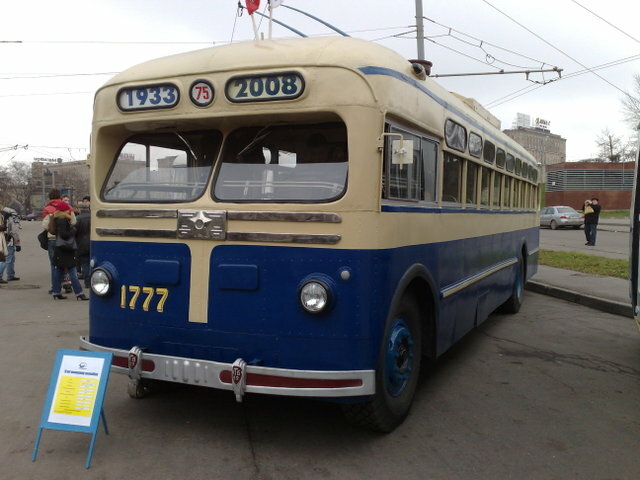 A vintage trolley bus in Moscow's 75th anniversary of trolley buses celebration. Photo by Vartal. Dale Laird from TRAMS passed along some links today showing Moscow’s Nov. 22 celebration of 75 years of trolley buses. They celebrated with a parade of eight vintage and new trolleys, much like we did in August for the 60th anniversary of our trolley buses. According to this English-language news video from Russia Today, Moscow has the largest trolley bus network in the world, with 1,600 trolleys on the system, 87 routes, and one million riders a day!! And through the magic of Google Translate, I managed to do a little digging and find a bunch more photo galleries of the Moscow trolley parade. And if you go to this forum page, there’s a huge list of parade photos from a Chinese bulletin board about halfway down the page. Not sure how that happened, but there’s trolley fans everywhere, I guess! The updated iPhone app features Google Maps integration! Hey, version 1.1 of TransLink’s iPhone app is now available! Instead of using PDF maps, Google Maps are now integrated into the app. Google Maps are more interactive maps that can display data like bus routes and stops, unlike a static PDF. You can now search for bus stops using full text, instead of inputting specific bus stop ID numbers. For example, search for “Burrard” and you’ll get a list of bus stops related to Burrard Street. Bus stops are now marked with directional information (westbound, eastbound, etc) to help users figure out which stop on an intersection they are looking for. Huzzah! A big hello to all of you who reached the blog through the app today! While a lot of phones support Java, only a little fraction of them have data services enabled. On the contrary, 98% of iPhone users actively access the Internet. Moreover, the demographics of RIM and Symbian users in Vancouver do not match the transit rider population in a way that the iPhone does. We carefully measure the stats of the universal mobile portal at http://m.translink.ca and iPhone users are the absolute majority there, with RIM being in a very distant second place. It’s a priority for us to provide service to everyone, but at the same time we work hard to improve the quality for those who use it the most. 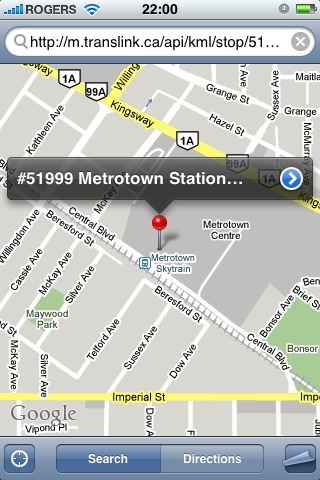 Did you know, by the way, that TransLink is the first Canadian transit system to create its own iPhone app? I found that out from a post by Greg Andrews over at Techvibes. Greg also says that the Toronto and Montreal transit systems have third-party iPhone apps that cost $1.99 and $0.99 respectively. Ours, on the other hand, is free. Also, here’s a few updated stats on how the rest of our mobile and web services are doing. Woo! e2 is a critically acclaimed PBS documentary series about the innovators and pioneers who envision a better quality of life on earth. The series has already done two seasons on design, urban planning, and energy challenges around the world, and this season, they’re taking a look at transportation. Anyway, I thought it was pretty fascinating just to see how another city deals with its transportation issues, and I just wanted to share in case you were interested. e2 has four more transport documentaries in the series which I know I’ll take a look at: subjects include Paris’ public bicycle program, Seoul’s restoration of a stream in its downtown core, Portland’s transit oriented developments, and aviation. And again, this isn’t a TransLink endorsed video or anything, and we’re not affiliated with the developers or their creation—I just thought it was neat! Thanks to Stephen Rees for pointing out this series on his blog. 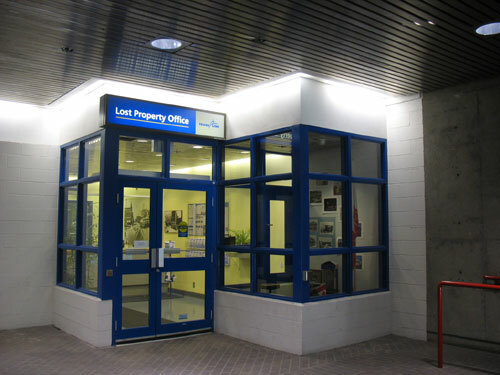 The Lost Property Office, located in a corner of Stadium Station. Regular readers will remember that I did a story on the Lost Property Office in the March 14 Buzzer. However, since this blog lets me show you way more photos and details, I thought I’d go back to Lost Property and do an update to that article. I went down to Stadium Station, where the office is located, and work leader Barb Szumilak gave me another tour behind the scenes. They collect about 4,000 items a month, and really, just about anything you could lose on transit winds up at the office. So next time you leave a shopping bag or an umbrella behind, go down there—they really might have it! Let’s take a closer look. SFU staff, students, residents of UniverCity and other interested parties: come to an open house on Wednesday and bring your thoughts about the future of the Burnaby Mountain transit exchange! TransLink, SFU and the SFU Community Trust are launching a study to consider the redevelopment of the exchange. With the introduction of the Vancity U-Pass in 2002 and the SFU Community Pass in 2006, transit use has increased significantly and the current exchange at the top of Burnaby Mountain needs to be expanded. And with projects like UniverCity and the SFU Town Centre redevelopment, the SFU area has seen increased growth and more diverse land use. We’re hoping to create an exceptional urban environment that supports the community’s commitment to sustainable planning, and encourages commuters to choose transit as the preferred mode of travel. We want the hub to be attractive, safe and functional, respecting the campus’ inherent character as well as the urban context of the area, and meeting the needs of the people now and in the future. So if this affects you, come to the open house—your opinion is crucial to the development of the plan and we want to hear from you. The open house is on Wednesday, Nov. 26 at Blusson Hall, East Campus Road at University High Street. Two sessions will be held: 8 a.m. to 4 p.m. and 6:30 p.m. to 8:30 p.m.
At the open house, you’ll get a glimpse of the future of the SFU area, and an opportunity to comment on preliminary plans for a new Burnaby Mountain transit exchange. Plus, you can find out a more about the planning and design process behind the plans. We hope to see you there!